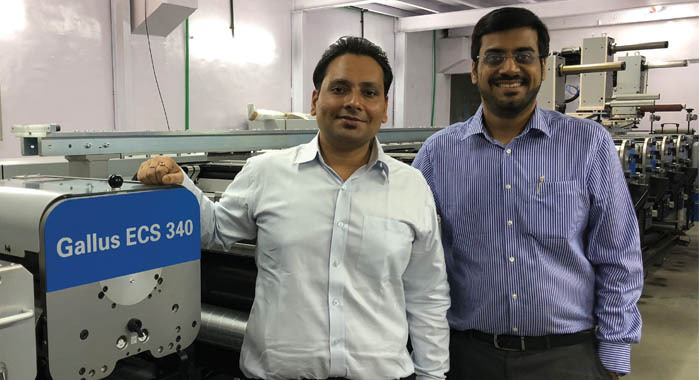 Vasai-based Sonic Labels has invested in a nine-color plus rotary die-cutting Gallus ECS 340 flexo press as it looks to cut down on its 15-day order log to less than half. The Gallus ECS 340 which is under installation at a new site in Vasai, and is expected to be up and running in the next two weeks. The eight-year-old company was started by Vaidya and his partner Aditya Ojha, both family friends. The two families ran manufacturing units, hence the two young men wanted to venture into a business which was low on manpower requirement but high on automation. “We had family members in packaging and corrugation, which meant labels was the option for us, which we took,” said Vaidya. The duo set up a plant in Vasai. Sonic is presently equipped with two Donghai six-colour UV presses, which it runs at 30 meters per minute. “Quality is not an issue, but the speed and color stations are,” said Vaidya. The industrial grade construction of ECS 340 and the automation of job data recall electronic presetting function along with short web and lightweight sleeve system help us faster job set up. The press also features servo drives on each unit, which combines with register control and dynamic print pressure so that print impressions adjust automatically allowing variation in press speed. The company presently converts 70,000 sqm of labels per months. “With the ECS 340, we hope to increase our production to 1.5- to 2-lakh sqm of labels per month” concluded Vaidya. Vasai-based Sonic Labels invests in Gallus ECS 340 Reviewed by Heidelberg India on May 21, 2018 .